There is a relatively new restaurant in Kansas City, Missouri called The Mixing Bowl Noshery. It is on Southwest Boulevard, not too far from Manny’s. They serve nothing but fresh local foods. 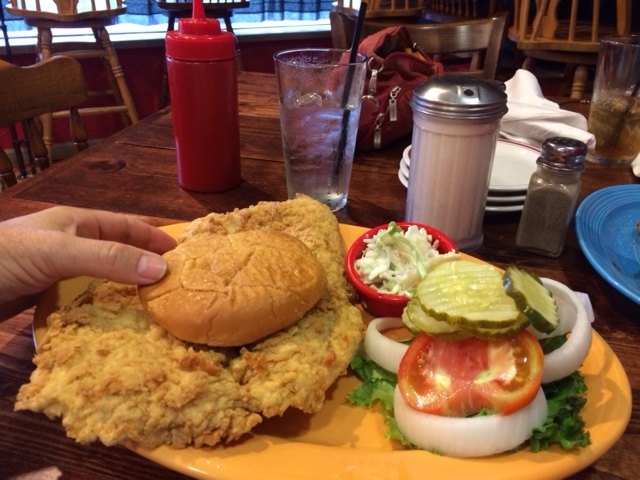 The photo above is their pork tenderloin sandwich. Note the relative sizes of the meat and the bun. That is a normal size hamburger bun, and it looks a little bit misproportioned to the size of the meat. The breading was not too thick. The slaw was home made, the food was fresh and hot. To top it off, nothing on the menu (that wasn’t a steak) costed more than 9.99. Great value. That is a beef patty with cheese cooked in, a ramekin of slaw like mine, and the garnish for her ‘burger’. She didn’t have them bring the bun. She is more serious about not eating starches and sugars than I am, you might think, until I tell you that she ordered a slice of pie for us to share, as a reward for eating such a smart dinner. Good pie, but it was about one fourth of a whole pie, so we shared. Put me even deeper in my hole. Since I was so far out of bounds, I piled the penalties on. We went to the movies and I got a small bag of popcorn and an orange soda. The theater we went to uses real oils on their popcorn, including REAL BUTTER. (Screenland Theater, Crown Center) The soda contained real sugar instead of HFCS and tasted like orange baby aspirin. It was still real starches and sugars, though. I left the theater tipsy from all the carbohydrates I had consumed. That night I sweated it out, and the rest of the weekend we managed to get by on Real Foods ™ not processed foods from boxes, bags, or bottles. Except I had four near-beers while I watched the Chiefs practice on Sunday. Except for that. This entry was posted in Health, Living, Reviews and tagged artificial ingredients, backslide, backsliding, carbs, Eating Right. Bookmark the permalink.